We provide the tools to make the magic happen! Note: The Tamron Lenses listed below will only be available through May, so try ’em out while we’ve got ’em! 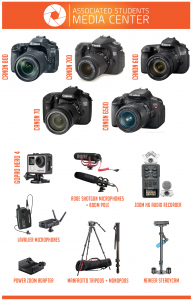 The A.S. Media Center, located in the AS Annex next to the Storke Tower bicycle circle, has video, photography, and other media equipment available to check out by UCSB students with a valid ACCESS Card. There is also a studio space for portrait and video shoots and 4 iMac computer workspaces where you can complete your projects using graphic design, photo, video, and audio editing programs, including the full Adobe Creative Cloud, Final Cut Pro 7, and Audacity a free sound editing program. See below for details. To check out equipment you will need your ACCESS Card, which we will photocopy. Generally, the loan period is 3 working days (over the weekend, Friday-Tuesday at noon). Equipment must be checked in by noon the day it’s due. This is a hard deadline! Because of high demand, it’s strongly recommended that you reserve the equipment you need by emailing media.center@as.ucsb.edu, calling 805.893.5422, or stopping in in person. Your BARC account will be charged for any lost or broken equipment. There are Canon and Nikon versions for each lens. Limit one lens per loan. 2 Wescott 40″ circular reflector kits. Adobe Creative Cloud, including Lightroom, PhotoShop, Illustrator, InDesign, Acrobat Pro, Premier, After Effects, and more. For complete overview, click here. Note: Adobe offers a Lightroom/PhotoShop bundle for $9.99/mo and the entire Adobe Creative Cloud for students is $20/mo. 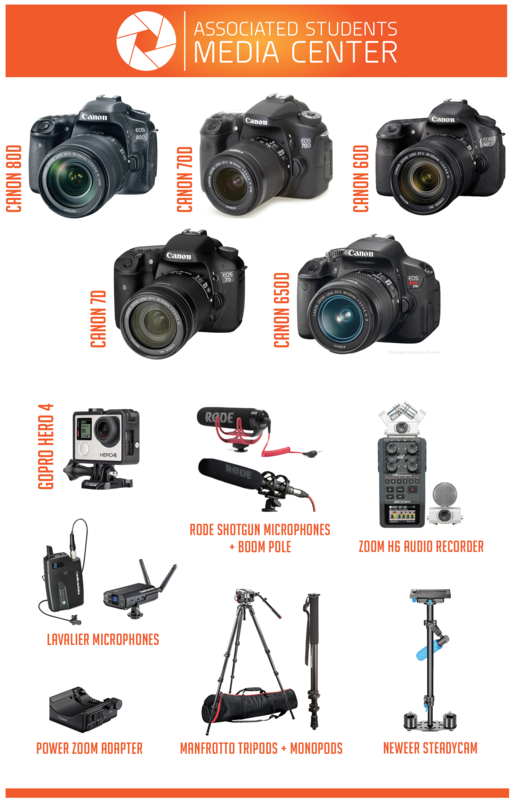 Includes still and video cameras, tripods, backdrops, green screen, lights for portrait photography and video and photography tethering computer.